What a roller-coaster season it’s been this year! 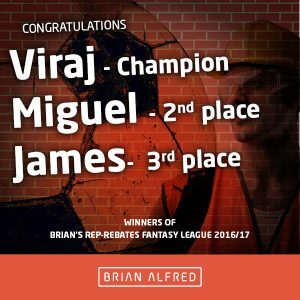 Chelsea chasing record breaking points, and Viraj Thakor walking away with Brian’s Rebate Fantasy League. Much like Liverpool and Arsenal, it was the fight for Europe that had us most interested. Last season’s winner Fergal O’Brien was pipped at the post by James Ledger to qualify for our 3rd prize (a crate of beer). Congratulations! Please get in touch to claim your prizes. Well done to everyone in the league, we’re sure we’ll see you all again next season.